Cora loves being in the kitchen, but she always gets stuck doing the kid jobs like licking the spoon. One day, however, when her older sisters and brother head out, Cora finally gets the chance to be Mama’s assistant chef. And of all the delicious Filipino dishes that dance through Cora’s head, she and Mama decide to make pancit, her favorite noodle dish. With Mama’s help, Cora does the grown-up jobs like shredding the chicken and soaking the noodles (perhaps Mama won’t notice if she takes a nibble of chicken or sloshes a little water on the floor). Cora even gets to stir the noodles in the pot—carefully– while Mama supervises. When dinner is finally served, her siblings find out that Cora did all their grown-up tasks, and Cora waits anxiously to see what everyone thinks of her cooking. Dorina Lazo Gilmore’s text delightfully captures the warmth between mother and daughter as they share a piece of their Filipino heritage. With bright and charming illustrations by Kristi Valiant, Cora’s family comes alive as Cora herself becomes the family’s newest little chef. **Interested in a signed copy of the book? Fill out the contact form and we can ship you one! 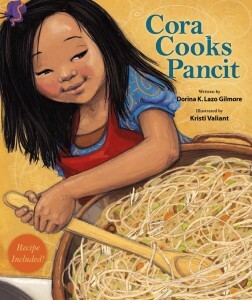 Do you absolutely love Cora Cooks Pancit? Now’s your chance to get this wonderful book on your mobile devices and tablets. Introducing the Cora Cooks Pancit app for both iOS and Android! 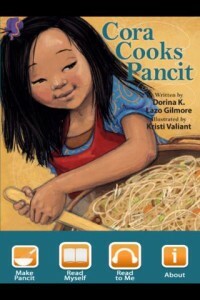 The app features the entire book, including its beautiful illustrations, glossary, and pancit recipe. In addition, it has a “read to me” option that features author Dorina Lazo Gilmore herself reading the book. All this for only $3.99, a fraction of the hardcover price. 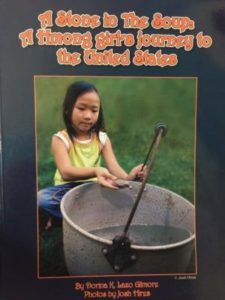 This story combines the adventures of a Hmong girl as she journeys to the United States with the “stone soup” fable popular in many cultures. Learn more about Pa and how making stone soup gathered a new community of friends for her. I’m so glad you found Dorina Kids Books! I hope I can serve you with great products, inspiring posts and helpful recommendations.